See two classic Hong Kong gangster films Saturday night! Tony Leung Chiu Wai, left, and Lau Ching Wan are the stars of the Hong Kong film The Longest Nite. Too Many Ways To Be No. 1, from 1997, and The Longest Nite, from 1998, were shown in Montreal in the early days of the Fantasia International Film Festival, so tonight’s screenings will have an added nostalgia value for people who saw the films back then. The very black comedy Too Many Ways To Be No. 1 is set in the months before Britain returned Hong Kong to China. Tense times! Petty criminal Kau, 32, hasn’t got very far in life and he’s contemplating his future. He’s wondering – should he accept a job taking stolen cars to the Chinese mainland, or not? The film shows what would happen if he did; then shows a scenario in Taiwan that could only happen if he refused the mainland job. These crooks are not the cool, suave, well-dressed types one sees in many gangsters films – they’re loud, clumsy and clueless. Camera work is unusual, with one scene shot upside down and another that takes place in total darkness apart from the flashes coming from guns. Kau is played by Lau Ching Wan, other actors include Francis Ng, Cheung Tat Ming, Carman Lee, Elvis Tsui and Matt Chow. Too Many Ways To Be No. 1 is from Johnnie To’s Milky Way Image Company and directed by Wai Ka-fai. It’s 90 minutes long, with Cantonese and Mandarin dialogue and English subtitles. I might also point out that Too Many Ways To Be No. 1 seems to be out of print, so this is a rare chance to see it. In fact, people are asking for $2,143. 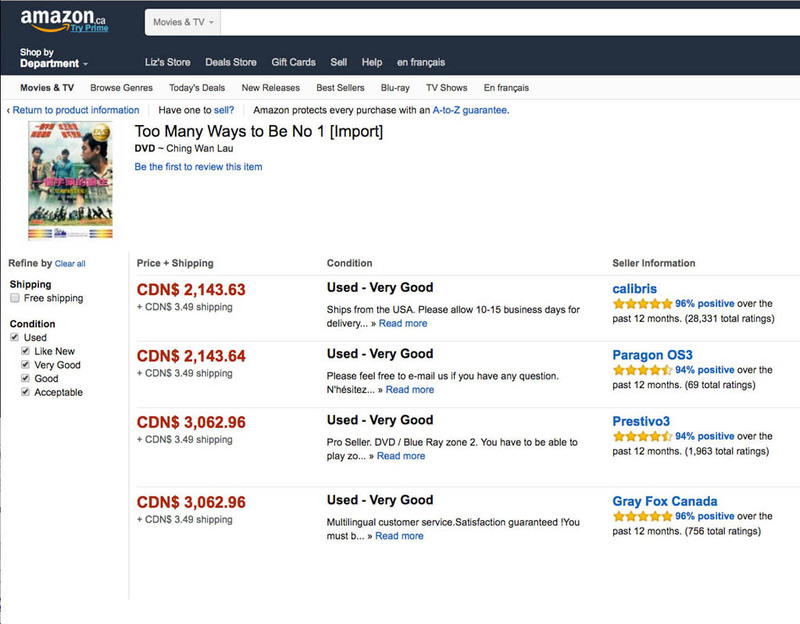 to $3,062 for a DVD via amazon.ca. Ha! As if! A person would have to be a VERY big fan to pay more than $2,000 for a DVD, don’t you think? Lau Ching Wan is also in The Longest Nite, along with Tony Leung Chiu Wai. 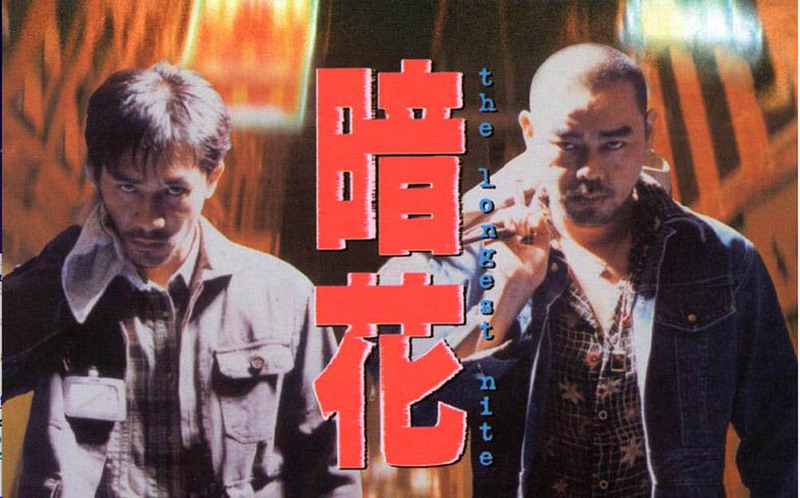 The film is set in Macao; Tony Leung plays a very crooked, very violent policeman who works for gangsters and Lau plays a burly, mysterious stranger whose shaved head makes him look extra scary. Unlike Too Many Ways To Be No. 1, there’s nothing funny about The Longest Nite. The Longest Nite is directed by Patrick Yau and Johnnie To, it’s 81 minutes long, in Cantonese with English subtitles. Too Many Ways To Be No. 1 and The Longest Nite, 7 p.m., Saturday, April 30, 2016, at the Cinémathèque Québécoise, 335 de Maisonneuve Blvd. E., Montreal, Quebec H2X 1K1, across from the Berri-UQAM metro. Visit the Facebook page for more info.